When introducing children to the joys of using a sewing machine, it can be a struggle to find a good sewing machine that is light and easy to use. Many basic sewing machines, while great for the average beginner, might be too large or too complicated for children to use, and may pose additional issues thanks to auto thread cutters or complicated tension setups. A good sewing machine for kids is simple to use, and also stitches slower than traditional machines. While they will not have as many stitches to work with as more complicated sewing machines, they should still have all the basic tools they need to work on their first sewing projects. While it may be tempting to invest in one of the cheap sewing machines at local department stores, investing in a high-quality, child-friendly machine will save you the frustration that comes from cheep machines breaking down or jamming mid-project. And by investing in a brand-name kid-friendly sewing machine, you’ll start building familiarity with different sewing machines, which can make the transition from a kids machine to a basic sewing machine much easier down the line. It’s always a good idea to introduce any young sewer to how to use a sewing machine before investing in a sewing machine geared towards children. Work with beginner sewers on how to wind a bobbin, what the different tension settings mean, and how to safely work a sewing machine. You want to teach them what a sewing machine can and cannot safely sew, and make sure they know that while their machine is made for kids, it does still have a moving needle, so they should be careful when working on their projects. Teach them how to switch stitches on a traditional machine, or look up some of the many helpful sewing tutorials geared towards children to help them get started on their next crafting adventure. And of course, make sure they choose a project they’ll have fun doing! Without further ado, here are the best sewing machines for kids. This is a good introductory sewing machine. The battery operated design allows it to be cord-free, and the compact design makes it easier to use with smaller hands. As one young reviewer pointed out: “I was excited when I got it for making teddy bear clothes… It was a nice starter machine.” This sewing machine does have a fair number of sewing options to choose from, which can be useful for more ambitious beginners but can become overwhelming for anyone just starting out. However, the built-in ruler and easy-to-understand instruction manual make this a great investment for any kid eager to start their sewing journey. This is a great sewing machine for beginners, and only holds the number 4 spot on our list due to its quicker than average sewing speed, which may frustrate young children. As one reviewer pointed out, “This machine doesn’t have a lot of features; however it takes care of basic sewing needs.” However, the SINGER Simple 3232 Portable Sewing Machine has many features that will help young sewers take on bigger projects, like an automatic needle threader, and a buttonhole stitcher, making it ideal for anyone looking to start sewing doll clothing or moving on to large projects. We recommend this sewing machine for slightly older children, as younger children might become overwhelmed with all the settings on this machine, not to mention the adjustable sewing speed. The Singer Start 1304 Sewing Machine is perfect for younger children since its simple stitch selection mechanism and easy-to-use design make it ideal for smaller hands. 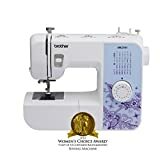 This sewing machine is compact for easy use and features 6 basic stitches to keep the variety to a minimum, so anyone learning the ropes of using a sewing machine can adjust to the basic stitches before moving on to the more complicated projects available. This is a very traditional sewing machine with no bobbin gimmicks or threading tricks, making it ideal for teaching on. As noted by one grandmother: “Bought it for my 9-year-old granddaughter for Christmas, she loves to make things. 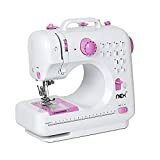 This is a great beginners sewing machine.” While this sewing machine is much more simplistic than many of the other options on this list, its streamlined design makes it perfect for younger learners and beginner sewers alike. 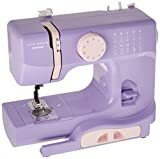 As far as intuitive sewing machines go, the Janome Lady Lilac Compact Sewing Machine is a great option for all ages. The clear bobbin base allows curious children to see the sewing machine in action while they sew, and makes adjusting the tension or keeping track of bobbin thread levels a snap. One reviewer, who purchased this sewing machine for their 8-year-old daughter, noted that she “love the ease of use for her (daughter), she doesn’t need help on anything!” And weighing only 5 pounds, this sewing machine is easy to move and use, making it perfect for on-the-go projects. As an added bonus, this sewing machine comes in nine different colors, making it the perfect option for anyone who wants to add a pop of color to their sewing lessons. And with 12 built-in stitches to work with, this is a great option for any budding seamstress or tailor. Brother is a brand you can trust, and with over 1,000 reviews, the Brother Sewing Machine XM2701 proves that it holds the top spot for beginners. Not only does this sewing machine come with a free instructional DVD, but it is also lightweight and easy-to-use so that any beginner, young and old, can get the hang of working with a machine. As one of the hundreds of positive reviews mentioned, “It’s quiet and smooth and doesn’t keep dragging my fabric off on an angle as my old machine did. Amazing quality for the price. I am absolutely delighted with this machine.” Whether you’re looking to help your assistant crafter take their projects to the next level, or want to help them work on their first quilt, this is the best sewing machine for kids thanks to its streamlined design and intuitive setup.